Abstract. The theoretical and methodological foundations trans-level functioning of accounting and management information systems indicative of the agricultural enterprise. 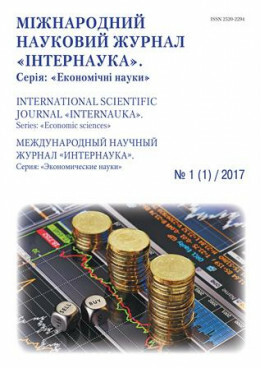 The article comparative analysis on the basis of accounting and information systems with the use of appropriate technology indicators. As a result, obtained summary information, the development of which is the mission of creating trans-level accounting and management information systems indicative of the agricultural enterprise. Keywords: trans-level accounting and information systems, indicative management, agricultural enterprises. Accounting and information systems functioned since the introduction of society. Any stage of society development needs to be managed. Its organization is in the interaction of the control and the controlled parts. The actual state of the latter compared with the desired by the requirements of management. This comparative analysis bases on indicators of accounting information systems using appropriate technologies. The result is aggregate data, development of which is the mission of such systems. Accounting information systems of agricultural enterprises in practice their activities are becoming different configurations depending on the purpose and place of using. The vast majority of structuring follows dispersible levels of indicative management. The justification of organizational and methodological provisions in managerial hierarchical levels is of a considerable interest of number domestic and foreign scientists. In particular, special attention should be paid to works of. Galushka V. P, Gudzinskas A. D., Zavadsky I. S, Kirasawa G. G., Kraevsky V. M., Lazaryshyna I. D., Savitskaya G. V., Savchuk V. K., Fatkhutdinova R. A., Filippova S. V., Black G. M., Chumachenko M. G. and other scientists. However, various specialists, who analyze this problematic issue, invest in it a contradictory sense. It indicates an ambiguous professional interpretation of this scientific question. We should pay special attention to trans-level functionality aspects of accounting and information systems in indicative management of agricultural enterprises. To explore the theoretical and methodological foundations of accounting and information systems trans-level functioning in indicative management of agricultural enterprise. Any entity includes production-technology and accounting information system. The first of them is the object of management, another one is the service tool. Both systems are in constant interaction, which is provided by communication. The implementation of system functions and their correction is under the control of management. And all this complex mechanism works for the main goal – increasing of activity efficiency . All accounting and information systems, data input transformate in the output information, which is then available to other users. Such accounting and information systems bring together intellectual and technical resources in the collection, processing, transfer and use necessary information. Many accounting and information systems have the reverse link which is defined as it receives notification of the goal indicative management. These accounting information systems are called cybernetic or self-regulating [3, p. 23]. Some accounting information systems provide the formulation of balanced indicators which are necessary for decision-making. The rationale for such indicators in the practical management of agricultural enterprises has three main levels of management: operational, tactical and strategic (fig. 1). Each has its own set of competencies and functions, requiring specific defined hierarchical information. Fig. 1. Indicators position explication in the accounting and information systems at the management agricultural enterprise levels. Developed by the author for [2, p. 92; 3, p. 24; 4, p. 54; 11]. Developing the idea in the context of the explications (fig. 1), we believe that the composition of the total accounting information system of indicative management agricultural enterprises include production of accounting information system and accounting information system of indicative management perspective. The first hallmark is a necessary tangent directly with the production process (operational level). At the time the ones correlate with intellectual procedures, seeking solutions (tactical and strategic levels). We consider them in the details. At the operational management level of agricultural enterprises the development of indicators is done through the business programs, production plans, marketing directory, financial reports, guidance materials, etc. At this level, management focuses on the using of internal data sources, requiring high formalization. Most of the decisions made are directed to one specific action. Meaningful and non structured information space can often be used to process disparate information optimization methods, such as linear programming. Accounting information system related to the operating stage of the management hierarchy includes the rights of the subsystems of the accounting information system of business operations, accounting and information system control processes and the accounting and information system of automation of offices [11;12, p. 166]. Accounting information system of business operations collects, processes and stores information which is the result of activities of agricultural enterprises maintains its information base, provides results of various documents, including preparation of reporting. This system evolved from the first manual accounting information systems and evolved to the level of auxiliary mechanical systems process information, and eventually to automated computer systems. It accumulates and processes information according to the results of business operations such as purchasing, sharing, selling, and summarizes the information generated by the diverse organizing of records, for example, in the files. Accounting information system of process control is designed for operational decisions, which adjust the situational progress in the work of agricultural enterprises, for example, automatic adjustment of stock quantities of products, management of collective lines etc. Such decisions are called programmable because they are computing by the machine independently on the basis of specified selection rules. The best alternatives are installed after a certain number of events have been mapped . Accounting information system of office automation provides in the activities of the agricultural enterprises functionality management and supporting their ways of communication. This system has moved to the past the traditional manual paper-based information transfer methods. To replace a typewriter and the letters appeared a text editor and email. The next holarchy structural unit of the balanced indicators development is tactical management level of accounting information system. It is characterized by the preparation of tactical plans and monitoring of their implementation in the agricultural sector. Managers face uncertainty and, as result, the complexity of the situations requiring professional analysis and intuition application and personal skills for solving problems at this level. Most of the used information comes from informal sources. It is collected and evaluated by each manager by himself. At the same time, managers use computer technologies to formalize official information. Indeed, external information is very diverse. There are many variables, including unpredictable behavioural and personal factors that make poor tactical decisions. The above-mentioned optimization models under such circumstances are insufficient, in contrast to the intuition of the leaders, although some algorithms can be implemented for the preparation of different kinds of synapses . In addition to reporting accounting information of a interim function, which is focused on achieving short-term targets, indicators the tactical level of management of agricultural enterprise perform the audit guide task. These level indicative management moderators are a part of an established monitoring system, which includes budget control, production control, inventory control etc. Continuously controlling function provides implementation opportunity of the targeting act to a managed object. Aiming to achieve a certain earlier policies management act, which is based on object data of accounting information system is called decision, and the procedures for its formation is called the process of decision support [6, p. 408; 11]. Accounting information tactical level system of agricultural enterprise management, ensure the development of balanced scorecard indicators is divided into accounting information system and accounting information system of decision-making support. Accounting information reporting system schedules and provides reports needed by the manager. It provides users with information products, which meet their daily needs, for decision-making. This system contains information about the internal environment of the enterprise that was previously processed accounting information system of business operations . Accounting information system decision support helps the manager to produce in each case in the mode of communication. It relies on computer accounting and information systems that simulate the solution using a special database. For example, spreadsheets, and other tools of modern software allow to the supervisor to get the direct answers provided to questions of type ‘what if?’ This distinguishes the decision-making support system from pre-defined summarizing consultation and other accounting and information systems. Practically using the decision-making support system the manager explores possible alternatives, having received experimentally verified information based on the results of the analysis of a set of assumptions before [8, p. 173 – 199; 11]. Strategic level of agricultural enterprises management is characterized by the fact that the mission, management objectives, long-term plans and strategy for their implementation are determined by the indicators development. Most of the strategic algorithms are often unstructured by their nature, that is why the formal indicative management accounting information system has a limited role in the processing of information. Besides, it receives limited information on sources of collecting the necessary data to identify potential dangers and opportunities. These circumstances determine the following characteristics of strategic information: 1) mostly external information, and a small internal array for which there is strong demand (critical and, therefore, extremely important is the study of the external environment, for example, trends in economic, technological and ecological environment, political factors, etc); 2) focus on the future (strategic planning is carried out on the basis of medium and long-term, so their predictions are vital and necessary for the managers tactical management level information about past results has secondary importance) [7, p. 170; 11]. Agricultural enterprises accounting information system of strategic management has the following basic functions: improves efficiency, promotes innovation, and generates strategic information resources. On their basis balanced indicators developed [6, p. 407; 11]. In fact, agricultural enterprises accounting information system strategic level management is presented in the form of executive accounting information system because it provides diverse information channels of communication, obtained from official and unofficial sources. Leaders received heterogeneous data in a variety of ways, including reports, letters, notifications, periodicals, advertising, etc. From the causes of accounting information system, indicative management is extremely important at this level to avoid stiffness general structural configuration. Flexibility as a property is updated more and there is more than one way feedback. We summarized its characteristics in the following theses: 1) feedback is used for routine reporting if required corrective actions in case of violations; 2) adaptation of the feedback is carried out as a response to a fix short-term plans and budgets in circumstances where the accounting information system recorded the fact of a change in the market; 3) the 'crisis' feedback aimed at addressing the unforeseen disorders that can change long-term plans [4, p. 56; 11]. The results of the review of accounting information systems by levels of management activities of agricultural enterprises has allowed the authors to specify the characteristics of the hierarchical indicative of dispersion in the range of functional and personal responsibilities of their managers. So, at the strategic level agricultural enterprises management needs to develop appropriate points is the responsibility of the small group leaders. We are talking primarily about the Director (President) and his deputies (Vice-presidents). As already noted, this guidance stage the mission indicators are formulated. The same as organizational goals, corporate strategy, key issues for its implementation, decisions regarding entering new markets, issuing additional types of products, attraction of investments, areas of research and possibilities of modern developments implementation [2, p. 96]. Tactical level of agricultural enterprises management is responsible for the balanced indicators development for the preparation and implementation of tactical plans (procedures) to implement the decisions that were adopted by senior management. At this level managers have fairly broad freedom of action regarding the mentioned plans implementation. For example, they independently determine how much should make new employees; what equipment to buy; how to use available information and other resources. This group includes production managers and functional managers. They are mainly agricultural enterprises chief specialists. Operational level the agricultural enterprises management generates the indicators, the adjustment of each direct perpetrator. This category, in particular, includes the chiefs of sectors, team leaders, foremen of departments, foremen of units (groups), etc [5, p. 306]. Consequently, senior level management of agricultural enterprise indicators summarize the formulation of a strategy, middle – development of implementation plans and the lower - specific work which is performed in accordance with these plans. Accounting information justification of the indicators in hierarchical enterprises management levels in the agrarian sector involves consideration of the organizational characteristics for the external management processes in agricultural production, in particular, within the system of state regulation of agro industrial complex. Naturally, in this case, the question arises about the concepts of 'governance' and 'regulation' for function and the ratio and correction objective and subjective in the management [1, p. 186]. Therefore, despite the connection closeness, interactions and interdependence, methodology, we think the most important to establish clearer their distinction. In our opinion, governance for content is a much broader concept that includes both managerial and regulatory functions of the state's influence on economic, social and environmental processes in agriculture, and in using its intersectional integration [9; 10]. We share the view that the main ideas which determine the indicator development in the accounting information and reflect the peculiarities of the current state of agriculture in Ukraine are: the accumulation and sharpening of contradictions of economic and political nature; the unprofitability of agricultural enterprises; the slow pace of reforming the industry; trends to narrowed reproduction. However, domestic agriculture remains a multiplier for sustainable development that predetermines the heightened attention from the state part. In our opinion there are global indicative joint interaction accents control of the participants in a dualistic context, 'the state agricultural enterprise (as a system AIC)': the provision of subsidies to agricultural production; strengthening of the regulatory role of the state in the reform of the sector; facilitating capacity expansion in the agricultural market; state support of agriculture; protectionism for domestic producers, etc [9; 10]. The state, through appropriate indicators tran-level accounting information systems, influences for the agricultural enterprises functioning in the framework of agricultural policy. We are for that major institutional units of the domestic agricultural policies implementation are the Ministry of agrarian policy and food of Ukraine, Department of agro industrial development of regional and district state administrations, Agrarian Fund, State manufacturers associations etc [9; 10]. We believe that they are all representatives of the relevant levels of management and at the same time the regulated activities of agricultural enterprises outside of themselves. Therefore, each of them generates its own indicators of certain personal location local accounting and information system. We are talking about the indicative landmarks of the managerial levels in the environment study of organizational formation, that is, the differential indicators of macro-level state, sector (district), meso-level and micro-level directly of such agricultural enterprises. Thus, to summarize, it should be noted that the agricultural enterprise is a complex object. It is necessary to consider in binary awareness of functional environment, the internal component of which is characterized by strategic, tactical and operational management levels and the external causes it is organizational formation as the initial micro-level. Further, in the hierarchical management pyramid is to examine the meso-level (district, region) and macro-level (state). Each of them is localized with corresponding accounting information system that produces their own set of indicators. Their validity is determined not only manently structuring and transcendence potentiating capabilities, but mandatory based on industry-specific activities such a monograph particular object of study. Afanasev M. V. Osnovy menedzhmenta: ucheb. posobie. / Afanasev M. V. — Xarkov: Idinzhek, 2003. — 481 s.
Belinskij P. I. Osnovy teoriimenedzhmenta organizacij: ucheb. posobie. / Belinskij P. I., Lukyanova L. M., Manilich M. I. — Chernovcy: “butltd”, 1999. — 188 s.
Svekla l. D. Finansovyj menedzhment v malom biznese: ucheb. posobie. / Svekla L. D. — M.: KNEU, 2002. — 84 s.
Vershigora E. E. Menedzhment: ucheb. posob. / Vershigora E. E. — M.: Infra-M, 2004. — 256 s.
Gerchikova I. N. Menedzhment: uchebnik / Gerchikova I. N. — M.: Banki i birzhi, 2002. — 478 s.
Griffin R. V. Osnovy menedzhmenta: uchebnik / Griffin R. V. — Lvov: bak, 2001. — 624 s.
Ermoshenko M. M. Menedzhment: ucheb. posobie. / Ermoshenko M. M., Eroxin S. A., Storozhenko A. A. — M.: Nacionalnaya akademiya upravleniya, 2006. — 656 s.
Informacionno-analiticheskij process: prakseologicheskij podxod / [Savchuk V. K., Kostenko A. M., Kraevskij V. M.]; Podobshh. red. V. K. Savchuka. — M.: izdatelstvo “Vekprint”, 2013. — 204 s.
Oficialnyj sajt ministerstva agrarnoj politiki i prodovolstviya ukrainy / [elektronnyj resurs]. — rezhim dostupa: http://www.minagro.kiev.ua. Oficialnyj sajt “uchebnye materialy onlajn” / [elektronnyj resurs]. — rezhim dostupa: http://pidruchniki.com. Oficialnyj sajt “vps-xosting” / [elektronnyj resurs]. — rezhim dostupa: http://www.topaz.ho.ua. Xmel F. I. Osnovymenedzhmenta: uchebnik / Hmel F. I. — M.: “Akademvidav”, 2007. — 576 s.